Whenever I finish doing any exercise I am always ravenously hungry, with a full on growling tummy, I have to stop and think and not reach for a snack and immediately undo much of the good I have just done. Of course I know that often the feeling of hunger is caused by dehydration, and am aware of the importance of properly re-hydrating after exercise, but sometimes I want a little more than just a drink of water. 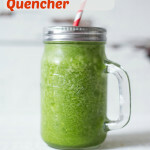 This green smoothie quencher is very refreshing and very gulp-able on your return from the gym, contains about 1 and a half portions of your five a day, and takes 30 seconds to whizz up in a blender. I use a Optimum 9400 Blender from Froothie, which makes quick work of frozen fruit and vegetables, I would not be without it – it is one of the few appliances that lives on the worktop and that I use every day. It is an investment when comparing the Froothie to the Vitamix the Froothie wins on price, power and (importantly if you live in a flat) volume! Froothie vs Vitamix review and comparison is here. If you do not have a power blender you can still make this in either regular jug blender or with s stick blender, just use chilled rather than frozen grapes, and be aware it will be not quite as smooth. If you try this Recipe: The Post Workout Green Smoothie Quencher please tag #FussFreeFlavours on Instagram or Twitter. It is amazing for me when for me when you make one of my recipes and I really do love to see them. You can also share it on my Facebook page. Please pin this recipe to Pinterest too! Thanks for reading Fuss Free Flavours! 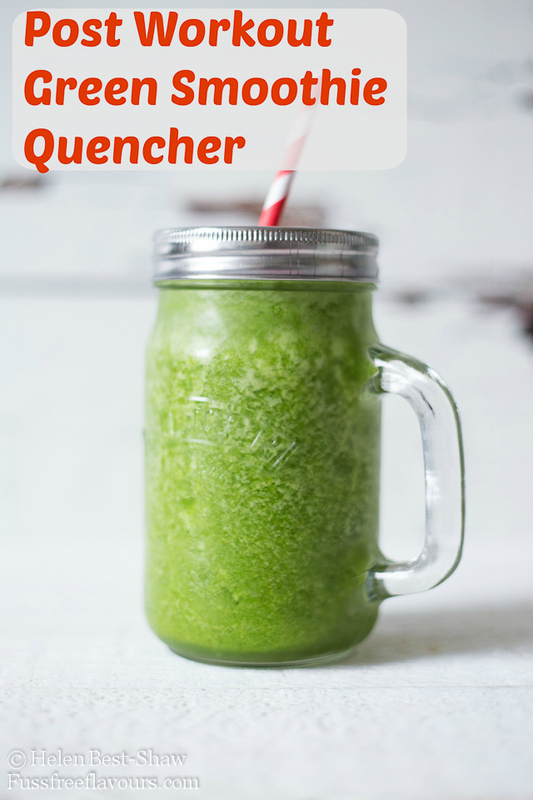 A light and refreshing gulp-able healthy green smoothie. Perfect for after a workout to rehydrate. Simply place all the ingredients into a power blender and whizz until smooth. I measure the ingredients by putting the grapes into the glass, then fill to 5cm from the top with coconut water before pouring into the blender with the spinach.